Your vehicle’s life expectancy can be extended by thousands of miles and a number of years by doing one simple thing. That simple one simple thing, getting your oil changed on a regularly scheduled basis. No matter the make or model, a vehicle calls for an oil change every 3,000 to 5,000 miles and if you do this, you won’t be disappointed. 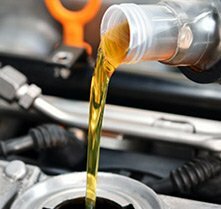 Make this service as easy and seamless and possible and bring any and all needs when it comes to oil change & fluids in Temple Hills, MD to Expert Auto and Tire. We are in the business of giving you high quality and affordable auto services that ensure your transportation continues to get you from point A to point B safely. Our team has seen every type of vehicle come through our shop. Our team consists of five ASE and UTI technicians, a master tech, and a Maryland State inspector. They know inner workings of many diverse types of engines and can pin point the exact type and grade of oil your vehicle may need. Oil change & fluids in Temple Hills, MD also includes those miscellaneous fluids. We will diagnose which fluids your car needs whether it be brake fluid, transmission fluid, windshield wiper fluid, or just that simple oil change. Our oil change & fluids in Temple Hills, MD will not disappoint. Whether you are driving an Audi Q5, Ford Focus, Kia Sol, or a Toyota Hybrid, our shop and team are equipped to take care of your oil change needs. With every oil change & fluids in Temple Hills, MD you receive from us at Expert Auto and Tire, we will provide you a 24 month, 24,000 mile warranty. That is how confident we are in our ability to service your vehicle. We truly care about keeping you and your passengers safe out on the road. No service is too small. No problem is too big for our team to take care of. We are conveniently located in Temple Hills and pride ourselves in our affordability and customer service. Give your vehicle a longer life expectancy and get that regularly scheduled oil change every 3,000 to 5,000 miles. Don’t forget to give us a call down at Expert Auto and Tire for any and all needs when it comes to oil change & fluids in Temple Hills, MD.